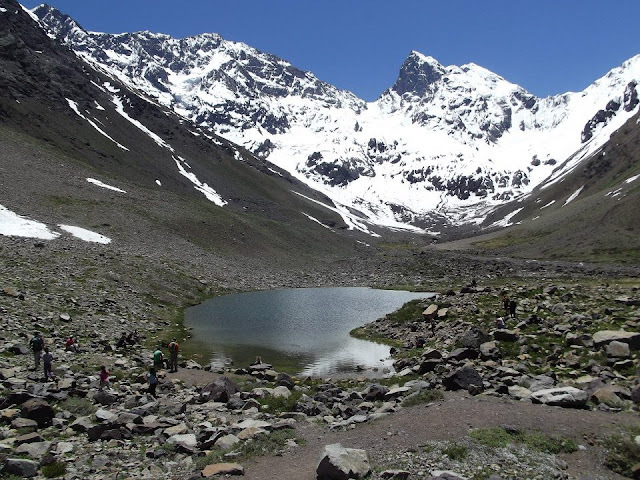 The "Cajon del Maipo" is a canyon located in the Metropolitan Region, one hour (just over 50 km.) to the Southeast of Santiago, it is formed by the upper basin of Rio Maipo. If it comes to adventure tourism this is the right place, in a setting where in the Winter you can make a variety of snow-related activities and thev rest of the year rafting, visits to hot springs and swimming pools, bungee jumping, canyoneering, horse riding, and visiting countless tourist attractions in a unique nature, at a short distance from the Chilean capital. The main urban and commercial center of the area is San Jose de Maipo, of 14,000 inhabitants. (Lagunillas Winter Sports Center), small winter resort run by the Club Andino, at 2200 mts. altitude, with the characteristic of being the only Chilean ski center of non-commercial character. There are in total 17 kilometers from San José de Maipo to the ski center, which has 200 hectares of skiable terrain and 13 tracks whose difficulty degrees range from easy, medium, difficult and only for experts. In a normal winter, the season should go from mid-June to mid-September. Off the ski season, there are no facilities available nor where to buy. Besides the traditional winter sports such as skiing and snowboarding, in summer the surrounding nature invites to activities like trekking, mountain biking and camping. (El Yeso Dam), this reservoir has a capacity of 253 million cubic meters, being the main source of drinking water for the seven million inhabitants of the Metropolitan Region, its waters are characteristic for having an intense turquoise colour, surrounded by glaciers and snowy peaks, it is a tourist attraction on any season of the year. It is formed by the damming of Rio Yeso, one of the most important tributaries of the Maipo River. Thermal waters from the San Jose Volcano, consisting of 3 rustic small pools, there are no facilities, however a dip in these waters is great, in an unspoilt, isolatedt environment, at the Cordillera de Los Andes, 115 km. East of Santiago and 68 km. of San Jose de Maipo. Although it is not a long road, but being a place of high mountains (almost 3000 meters a.s.l.) you must go prepared to face low temperatures and stocked with provisions. 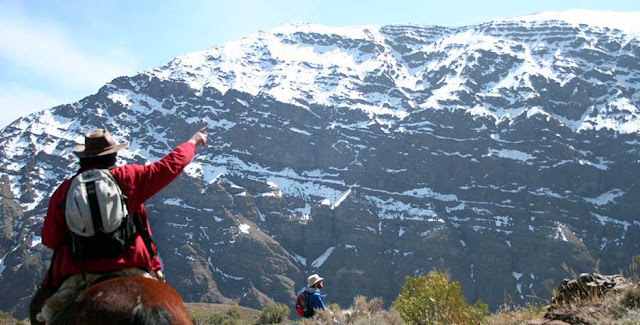 You can also go trekking, or simply take beautiful pictures of the Andean landscape. 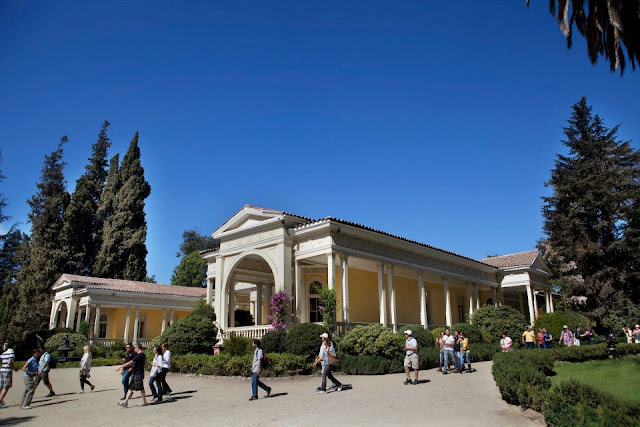 The quality of the Chilean wines is worldwide recognized, this is a guided tour around the facilities of the largest wine company in the country, located in the area of Pirque, Valle del Maipo (Maipo Valley), 45 minutes from Santiago. Founded in 1883 when its first vines were brought from Bordeaux, France. These grapevines developed extraordinarily well in the fertile lands of Valle del Maipo, where the conquerors had already founded the first vineyards during the colonial period. Today this is a wine region par excellence and where other prestigious wine brands are also produced. At the end of the tour through the centenary facilities you will be able to visit the wine-shop, where is possible to buy a wide range of wines and souvenirs that will remember your visit to the place. This 13,085 hectares Nature Reserve is located 45 km. of Santiago, in the Commune of Pirque, being the closest to the Chilean capital. It is managed by CONAF, National Forest Corporation. Core of this ecosystem is the hydrographic basin of Rio Clarillo, which supplies water to the metropolitan communes of Pirque and Puente Alto. The Nature Reserve has an environmental information center, hiking trails, (from hiking trails for people with motor disabilities and seniors to other more demanding and of long extension), 7 picnic areas, native flora and fauna to photograph. Rio Clarillo Natural Reserve stands out as the only refuge of many animals and birds, some of them at risk of extinction from this area as the Torcaza. Baños Morales is a small village and thermal bath center located to the southeast of San Jose de Maipo and 92 Km. From Santiago, at the confluence of rivers Morales and Volcan. It is also gateway to Monumento Nacional El Morado, one of the most visited protected areas in Chile. This thermal center is made up of three light brown color pools, rich in potassium, iodine, sodium and chlorine. The average water temperature is always above 25 ° C., very suitable for people with rheumatic and skin problems, and to escape from the stress of the city. Baños Colina is the third of a trilogy of Thermal Baths that you can visit in the area of Cajon del Maipo. This thermal center is made up of nine natural pools arranged in staggered terraces, situated 104 km. from the capital of Chile and at 3500 mts. a.s.l. The waters can reach a temperature of up to 55° C. (131° F.), highly mineralized and from the bowels of the San Jose Volcano. Although it is open to the public most of the year, from October to April are the recommended months to visit the Baths. The infrastructure is very basic but there is a place where to camp and a restaurant. In this unique environment of the Central Andes you can combine relaxation and adventure by hiking, horseback riding or climbing the imposing surrounding hills. El Morado Natural Monument is a Protected Area managed by the Corporacion Nacional Forestal, situated 93 km. of Santiago, in the town of Baños Morales, close to the border with Argentina. The main access road is Ruta G-25, which connects Puente Alto to San Jose de Maipo- El Volcan. The whole area is dominated by the Cerro El Morado of 4,674 meters a.s.l. and which owes its name precisely to the amazing purple color that projects the rock of the south wall. There is only one hiking trail, from the administration to San Francisco Glacier (8 km), approximately 3 hours of climbing, on winter open only its first 3 kilometers to the Aguas Panimavida area, since the accumulation of snow can reach 1 meter high. This tour offered by local agencies allows to know the existence of millenary glaciers just few kilometers from the capital of Chile.